With the April general membership meeting behind us, I would like to thank Judge B. Glen Whitley for speaking to us about county taxes—how they are being spent and what the future looks like as far as tax necessities go. I would also like to thank the past officers: Jan Buck, Freda Calabrese, and Burney Dickinson. Jan Bass is continuing on as our treasurer for another year. 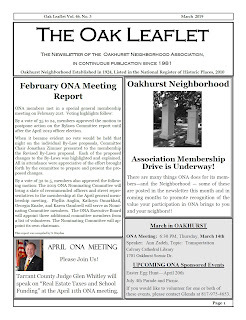 This month's issue of The Oak Leaflet is now online! 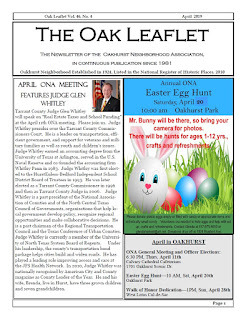 Click on the image below to read Jan's President's Column, make note of upcoming activities and events, and more.